An interesting one is Ruthin (in Denbighshire). This is an English spelling (the Welsh is Rhuthun) but it's pronounced /ˈrɪθɪn/, with the u treated as would be expected in the Welsh form. JHJ - this BBC website, which I think John Wells discussed a long while ago, has Ruthin pronounced ˈrʌθɪn - http://www.bbc.co.uk/wales/whatsinaname/sites/howdoisay/. But I don't know what to make of that. John Wells - David Dimbleby on Question Time a few months ago did pronounce Llandudno with ɪ, and the first time he also used ɬ, but when he repeated it a moment later he instead said klænˈdɪdnəʊ. The issue is Anglo-Norman spelling of Welsh placenames, which makes knowing how placenames are pronounced in certain parts of Wales and Herefordshire very difficult indeed. With Rhuddlan there's the added confusion that words "rhudd" (a shade of red) and "rhydd" (free (as in speech)) both exist. They're homophones, and the latter is probably more common. The "y" vowel would alternate to a schwa in compounds and could well get spelt as "u" in an Anglo-Norman spelling. Unless you know for sure that "Rhuddlan" is the form that conforms to standard Welsh orthography (as it does in fact), you're going to run the risk of guessing wrong. Which brings me on to a magnificent case of getting a place-name wrong. There is a village in Gwent that in standard Welsh is spelt "Llanhiledd", but has a common Anglo-Norman alternative version "Llanhilleth". Rather predictably, the re-opening of its railway station saw the recorded announcements at Cardiff Central create the spurious /ɬænˈhɪɬɛθ/. It's a miracle I've never heard anyone butcher "Caerphilly" (i.e. Caerffili) like that -- this is probably thanks to only to cheese. Off the top of my head, other dodgy Anglo-Norman spellings include: Penally (Penalun), Cornelly (Corneli), Llanrumney (Llanrhymni), Trethomas (Tretomos), Aberdare (Aberdâr), Abercrave (Abercraf), Aberbeeg (Aberbîg), Abertillery (Abertyleri), Rudry (Rhydri), Cilfrew (Cil-ffriw) and the magnificent Pengethley (Pengelli). And there must be a dozen examples of "Dyffryn" getting spelt "Duffryn". Of course, they have a tendency to come up in places where correct Welsh doesn't get much appreciation. But probably the most amusing bit of those Anglo-Norman folk mangling Welsh is a street in Cardiff called Pen-y-wain Road. There are Welsh words "gwain" and "gwaun" (both feminine nouns, so they lose the "g" after the definite article "y"), and in south-eastern dialects they're homophones. I think you can guess where this is going: they probably wanted the other one. 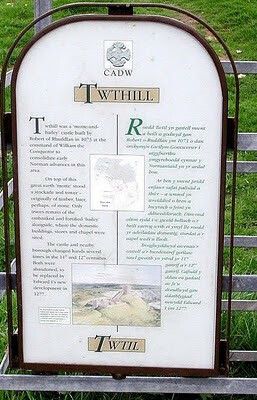 There are several Toot Hills/Toothills in England (http://www.surnamedb.com/surname.aspx?name=Toothill, and there's one in Swindon, too) Perhaps Twtil is a Welsh one? One of the first google hits was http://cy.wikipedia.org/wiki/Gwain and the pictures didn't show sword depositories. I live just outside Chester, over the border into Flintshire. I'm located at 'Rhuddlan Court' and when I attempted to pronounce this the Welsh way during a telephone conversation with Flintshire County Council, it was repeated back to me as 'rʌdlən'! On a completely different track, can Rhuddlan, its pronunciation, its meaning, et-al, be taken back to an earlier period, say to the 4th, 5th, and 6th Centuries? Then it was known as 'Alt Clwyd'. Not a lot of people know that! Now that is a story worth following, it is a shame that it has been absorbed into Scottish History.